Many image transfer techniques require a 24 hour timeframe. This quick process allows you to transfer images within minutes! Think Adult Coloring book images on canvas, wood, Plexiglass and paper. 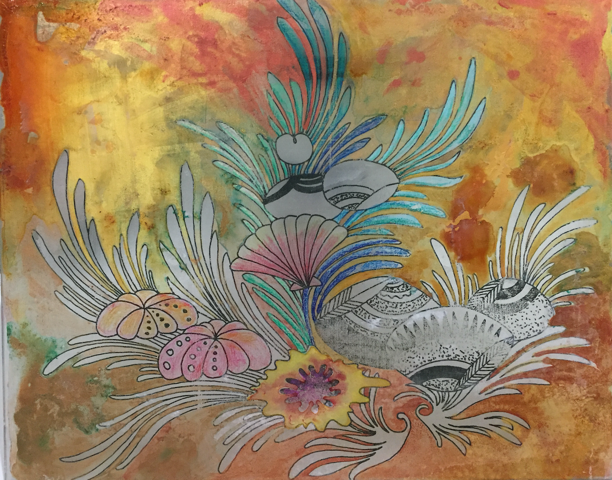 Apply your own drawings, sketches and Zentangle inspired art . . . and then embellish them with color! Options to finish your art include but are not limited to watercolor, acrylic, colored pencils and pastels. Learn the process and experiment with a variety of materials to illuminate the image. $60 per person for 3 hours. Includes VIP seating for the Lecture/Demo in the morning (please also register for that separately here), plus a special continental breakfast reception from 9 - 10am prior to the Demo. Canvas, plus a variety of grounds and colors to play with!